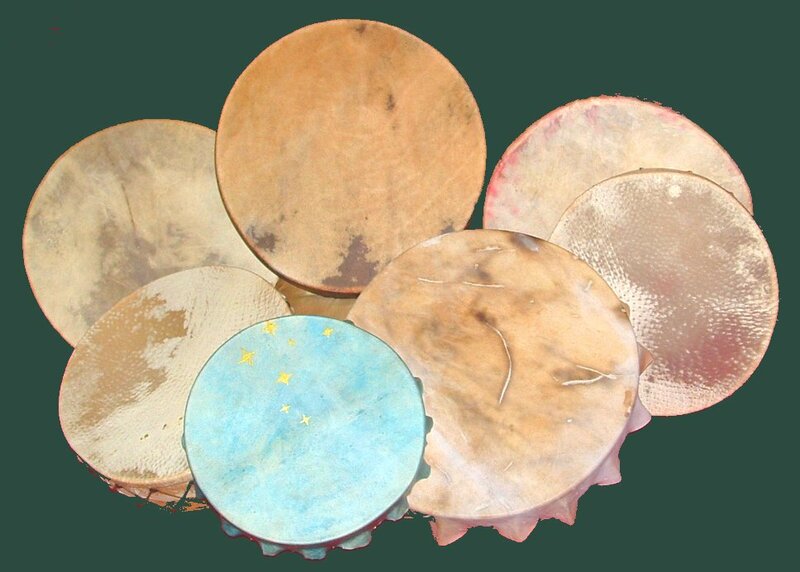 In 2006 during a rest period at the Sun Moon Dance I had a vision of 7 Peace Drums in varying sizes and styles; made with different hides, by groups of people at specific times during the year. These drums had to travel the world to carry the Blessings of Peace, Love, Light and Beauty to the people, the land and everything that exists. Number 7 is CHO O - Power, Energy Radiating out to Everywhere. 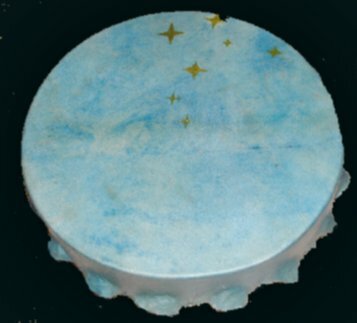 THE I AM DRUM - the first drum, was made on the 07/07/07 after the monthly Sacred Fire Ceremony for the cleansing of the cosmic oceans and physical waters. It is made from goat hide dyed blue with 7 gold stars painted on its face. 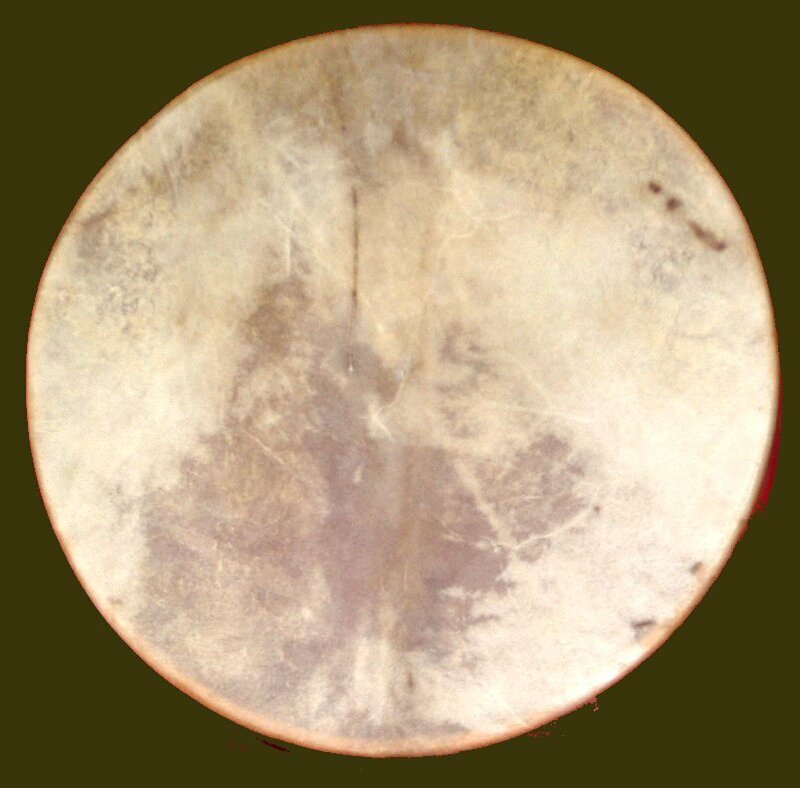 THE CHILDREN'S DRUM for the East is made with Calf skin. It was made on the 12th July 2007 by 7 Children. The hoop is covered in the childrens coloured hand prints. THE HEART DRUM OF LOVE AND COMPASSION for the North was created by 10 very close friends who get together on a regular basis at Gordon and Joyce O'Brien Green's home to drum and flute. 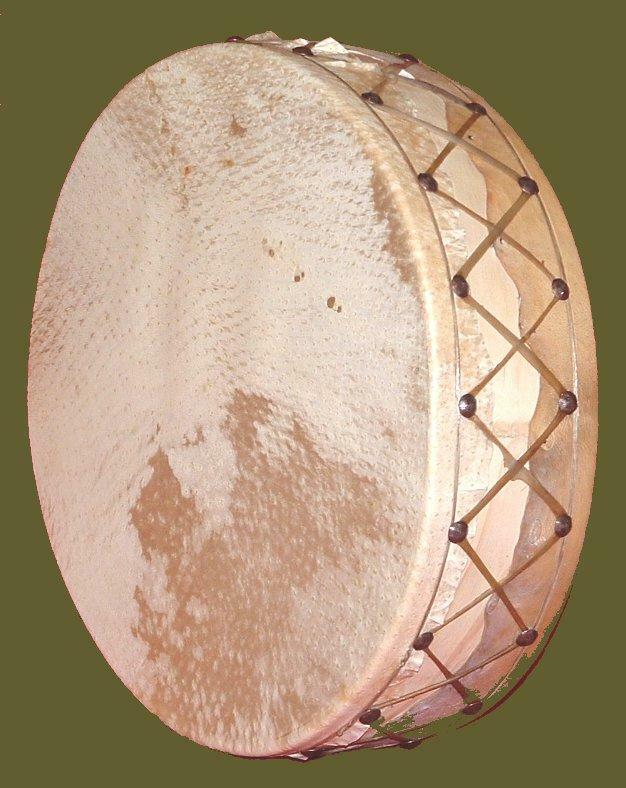 This beautiful drum was completed on the 6th August 2007 from Bison hide. THE LOOKS WITHIN DRUM for the West was made by a large group of people who attended the Castlemaine Alternative Expo on the 11th & 12th August 2007. It is made with the hide of a stag whose skin bears its battle scars. Such an appropriate skin for the West. The place where we battle with ourselves to let go and let God or, keep fighting the same fight on just another day. 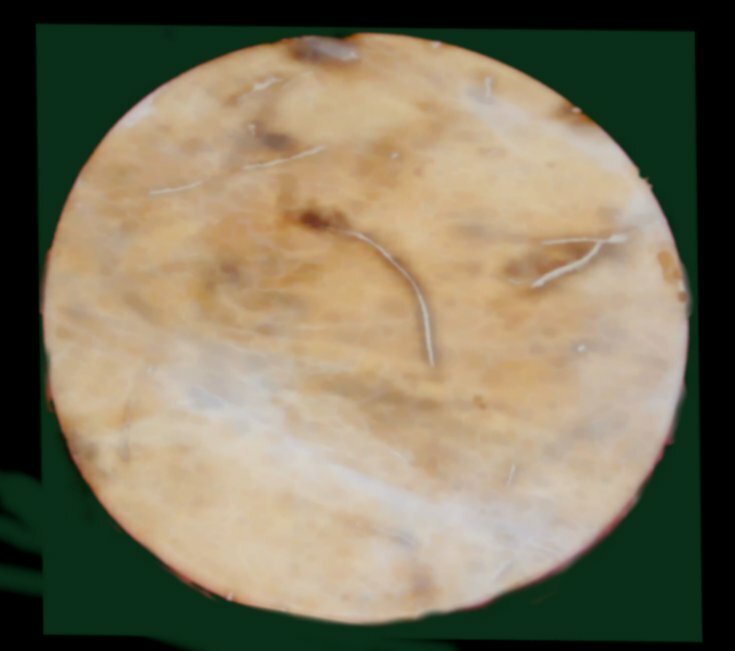 THE DANCERS DRUM for the South is made from Emu skin. 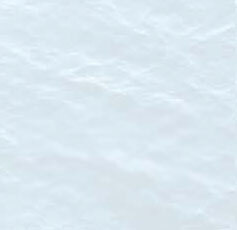 Emu skin is paper thin and transparent. This drum was made just before commencement of the first Sun Moon Dance at Uluru, Australia on the 21st September 2007. Seven women dancer's plaited and wove ribbons in the dusty heat to create a sweet drum that is the essence of the cyclic Dance of Life. This drum was played at the Dance. 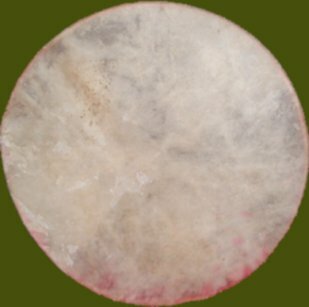 ALL MY RELATIONS DRUM made from Kangaroo hide sings of inter-connectedness. It was made by Michael and I on the 1st November 2007 - All Souls Day. A drum that connects all that exists from ancientness of the past to this moment in time. 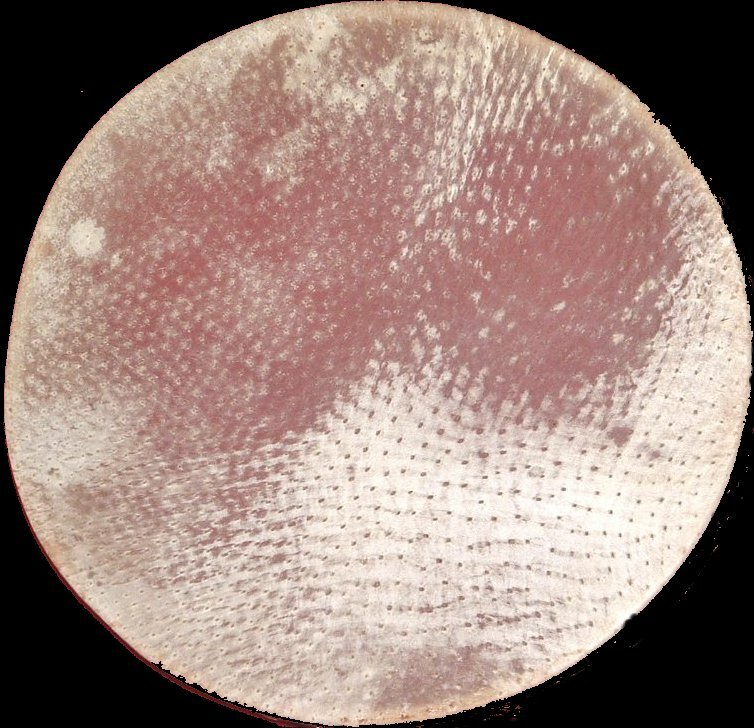 Made on the 1st September is a double sided drum made from Emu and Deer hide - two animals that represent the northern and southern hemispheres. 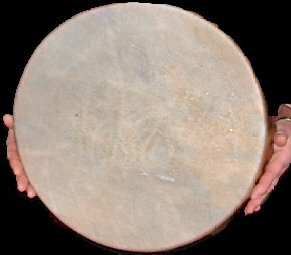 This drum when played on both sides simultaneously places one at the very heart of the Up Above and the Down Below and calls us to remember that love is at the heart of everything.